If you thought storytelling was as simple as telling a story, then you’ve never been on a stage, in the spotlight, microphone in hand, in front of hundreds of people with no idea where the tale you’re telling is going — and all you can do is hold on for the ride. Even if it’s your half-secret dream — which of course it is — live storytelling is still terrifying. Go ahead and take inventory: Here’s the little pool of light; here’s the microphone; over there, stage left, is perhaps a stray stool. You can’t see the audience. The light’s right in your face. You begin. And here’s all you’re hoping for, really: that some line early on that you didn’t know would be funny actually is. The crowd can read that surprise on your face, and now everything feels a little more natural. Now there’s the space to take a chance or two. Now the whole thing opens up like a magic carpet ride. 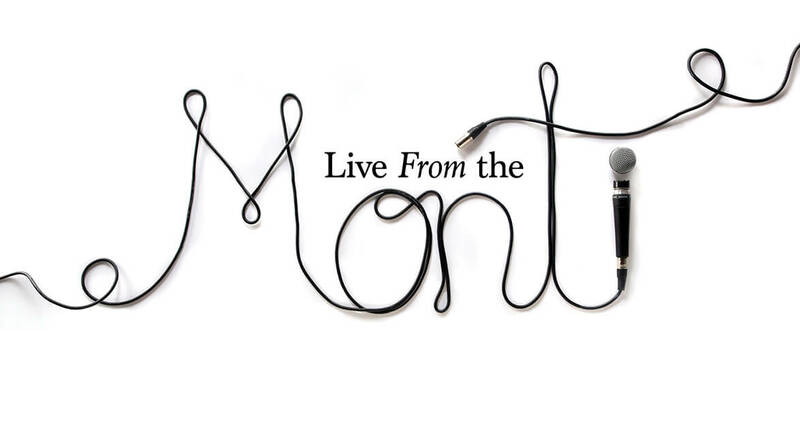 This is The Monti, a live storytelling series that roams the state but is based in Chapel Hill. It is a place of great friendliness; it is a place, regardless of venue, filled with people who want to laugh. Who want you to do well. If The Monti’s founder, Jeff Polish, is your coach — which he is, and a damn fine one at that — then the crowd is your family. Still. No matter how many times you do it, this never changes: That stage. Those people. Just you. In one way, it’s a little like standing in front of a college classroom, something I do several times a week: You’re trying to talk strangers through something you think might matter. In another way, though, it’s nothing like teaching: You’ve got 70 or 80 or 200 people out there in the dark who have paid actual money and are nursing their drinks and would like very much to be entertained — perhaps at your expense, and at least with your help. So never mind: Save for the numbers, maybe in most ways it’s exactly like teaching. I treat the 12 minutes as a series of channel markers, or trail blazes, or whatever metaphor works here that means hoping like hell to get from one thing to the next. The time the baby (for instance) knocked wine into my gym shoes is meant to trace toward my abiding obsession with both the children’s sleep and my own. A four-story inflatable blue gorilla on a South Carolina Honda lot leads to me army crawling, naked, beneath a hotel room sofa bed, a vial of baby Advil gripped Rambo-style in my teeth, trying to reach the squalling infant without waking the sleeping toddler. The story — this one, anyway — is supposed to end at the vasectomist, which is not a real medical title, but it’s what I was calling him in my head. I practice in the shower, in the car, lying in bed at night — but the connective tissue between those moments is different every time. Live storytelling. No notes. No net. At some point, I forget I’m up there, though that’s not quite right. My voice in the speakers, me wondering in a kind of dissociative way if my skinnyish jeans are, in fact, making me look not so skinny, a growing panic about whether or not I already did the police officer part — all of that makes it hard to forget I’m doing what I’m doing. But also, I can lose myself, if I’m lucky, to the rhythm of storytelling. A story that’s working wants to tell itself. Good things start to happen. Happy accidents. And then I’m just trying to keep up without leaving anything out. Storytelling is like writing, except that it’s like doing it while holding a lit fuse. Or while holding my 2-year-old son, who is a bowling ball hooked up to a car battery. Storytelling is like writing, except that it’s like doing it while holding a lit fuse. Or while holding my 2-year-old son, who is a bowling ball hooked up to a car battery. Which means that I love it, even though I run the fairly reasonable risk of getting maimed. You get addicted pretty readily to that plywood stage, to Polish warming up the crowd, to him promising them you’re a little crazy just before you get the chance to prove it. You get attached in a kind of primal way to standing at the mike, and to that taut, fizzing moment before you start talking. I like comedy for the way it can circle the tragic, or even just the serious, without letting the audience in on the whole deal right away. Comedy is sneaky. It’s dazzle camouflage. Often enough, I’m up there telling stories about raising two lunatic boys under the age of 5 and trying to prop a marriage up over that, but any given piece is also, I hope, about trying to believe we’ll all survive with our hearts and heads intact. People want to laugh, but they also need you to confess something; they need you to give them something that, under any other circumstance, you would not. Next time I talk to Jeff Polish, I’ll tell him that I think I’ve got another one. I’ll tell him that I’ve somehow become addicted to a hyper-fierce aerobics class at the gym. That the class is like Jane Fonda meets Full Metal Jacket. That, as a result of the music in said aerobics class, I now know who Taylor Swift is. That I may now like Taylor Swift. That I am learning how to Grapevine (a complicated, for me, aerobics move) without crashing into one of the mirrored columns in the room. That none of this has one thing at all to do with the fact that I turned 40 this year. That the kids are easy. That my wife and I never fight about mindless things. That everything, like always, is totally fine, and sure, I’d love to tell a room full of people all about it. I don’t know where the story is in that, yet. But we might find out where, if you give me 12 frantic minutes behind that Monti microphone.